His first book, "The Bounty Hunters," was published in 1953. His writing career began with pulp Westerns, only settling into the trademark Leonard realism, crime and wit with 1969's "The Big Bounce," which has been adapted for the movies twice. His most recent novel, "Raylan," was released in 2012. 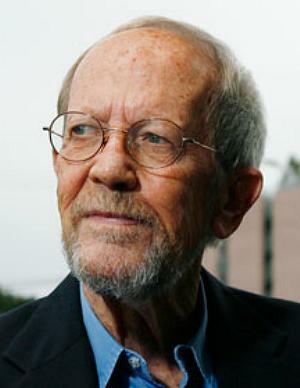 In his widely circulated rules of writing, Leonard said, "Never open a book with weather; avoid prologues; keep your exclamation points under control; use regional dialect sparingly; avoid detailed descriptions of characters, places, and things; and try to leave out the part the readers tend to skip." His millions of fans, from bellhops to Saul Bellow, made all his books since "Glitz" (1985) best-sellers. I have twenty-two Elmore Leonard's on my bookshelves and a few more on Kindle. I used to have more in paperback but as the paper became brown and brittle I discarded them, once giving a couple away to a guy who wanted to learn to write better dialogue. Leonard was particularly good at writing dialogue. I bought his books knowing they would be good and, not only that, but that they would bear re-reading, and I have never been disappointed. It's good to know that there are more out there, mostly early ones, that I haven't yet read.